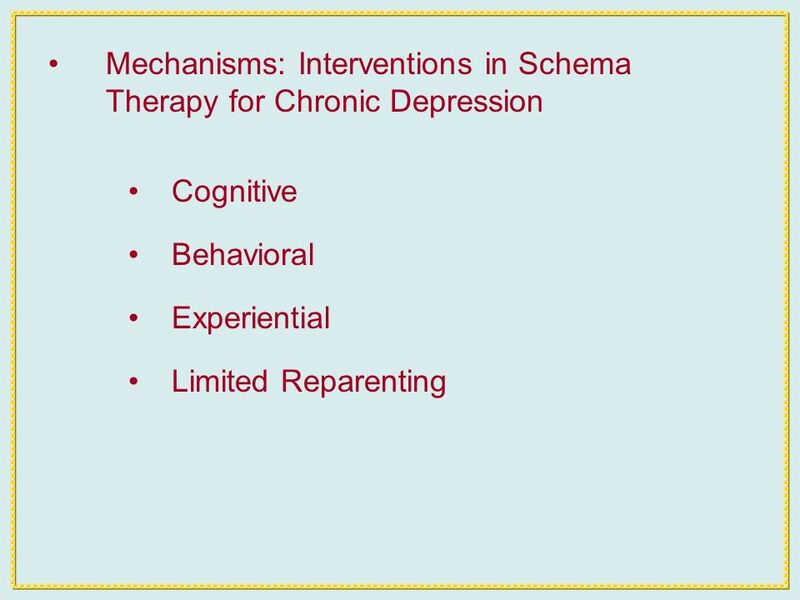 An Inquiry into Possible Mechanisms of Change in Schema Therapy for Chronic Depression Nathan Thoma, PhD Instructor of Psychology, Weill Cornell Medical. 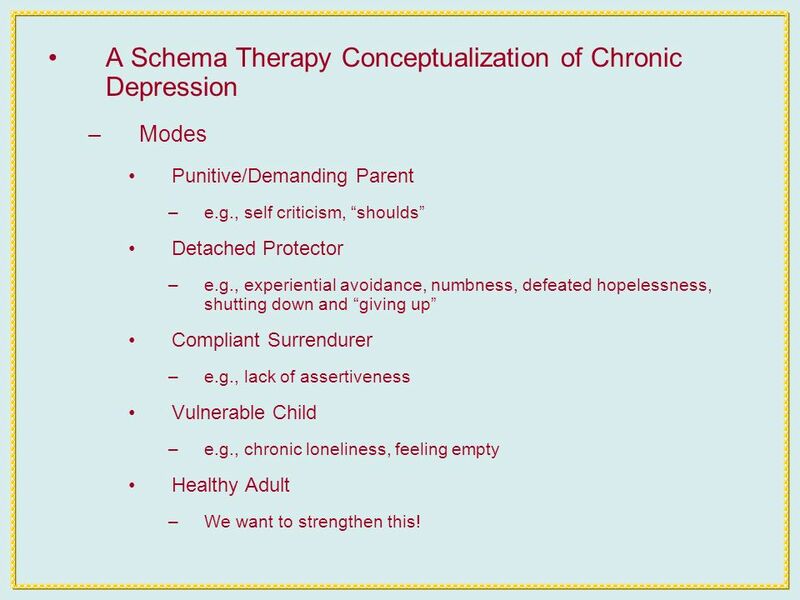 6 A Schema Therapy Conceptualization of Chronic Depression –Modes Punitive/Demanding Parent –e.g., self criticism, shoulds Detached Protector –e.g., experiential avoidance, numbness, defeated hopelessness, shutting down and giving up Compliant Surrendurer –e.g., lack of assertiveness Vulnerable Child –e.g., chronic loneliness, feeling empty Healthy Adult –We want to strengthen this! 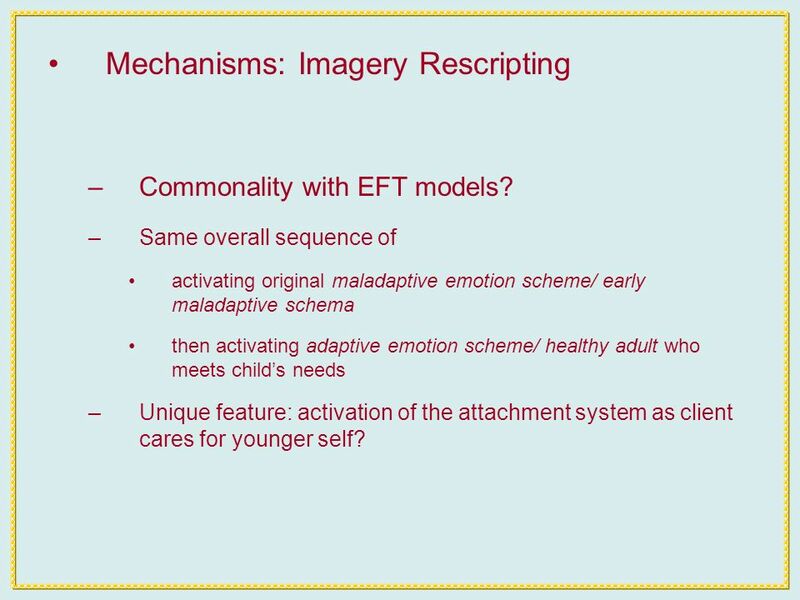 17 Mechanisms: Imagery Rescripting –Commonality with EFT models? 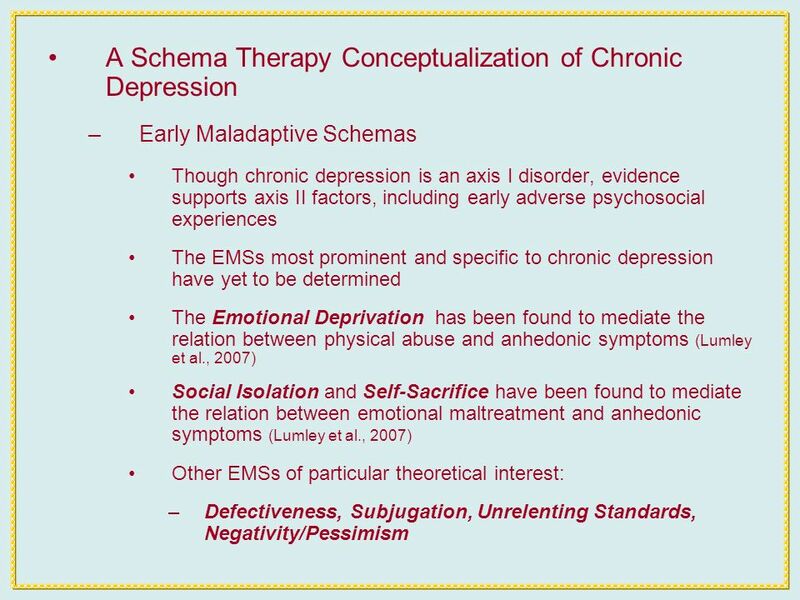 –Same overall sequence of activating original maladaptive emotion scheme/ early maladaptive schema then activating adaptive emotion scheme/ healthy adult who meets childs needs –Unique feature: activation of the attachment system as client cares for younger self? 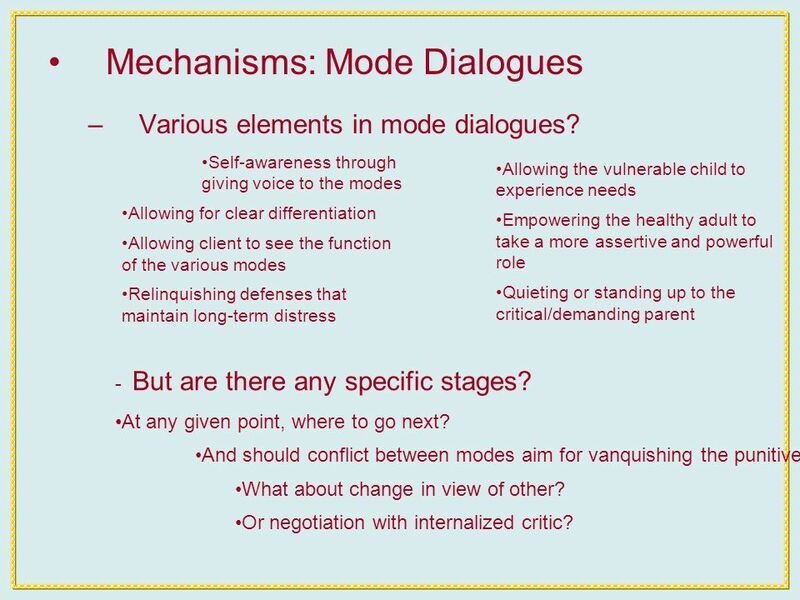 20 Mechanisms: Mode Dialogues –Various elements in mode dialogues? Self-awareness through giving voice to the modes Allowing for clear differentiation Allowing client to see the function of the various modes Relinquishing defenses that maintain long-term distress Allowing the vulnerable child to experience needs Empowering the healthy adult to take a more assertive and powerful role Quieting or standing up to the critical/demanding parent - But are there any specific stages? At any given point, where to go next? 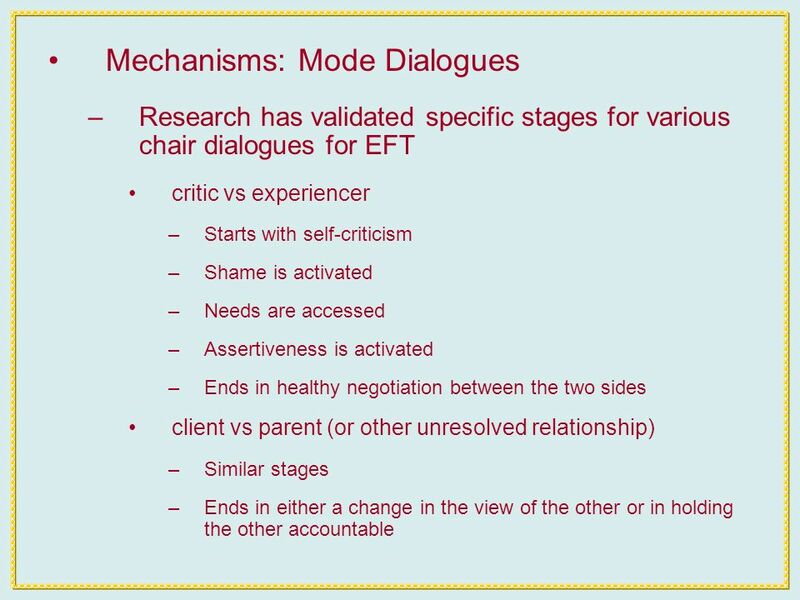 And should conflict between modes aim for vanquishing the punitive parent? What about change in view of other? 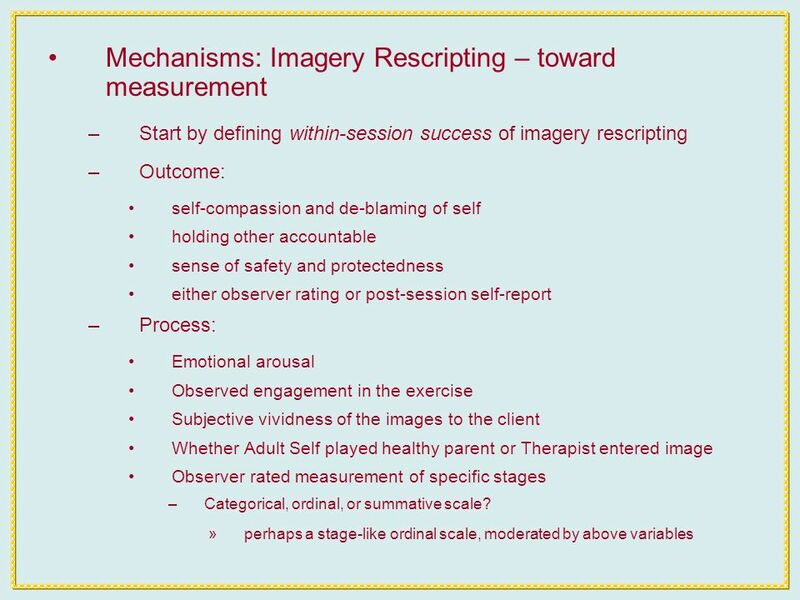 Or negotiation with internalized critic? 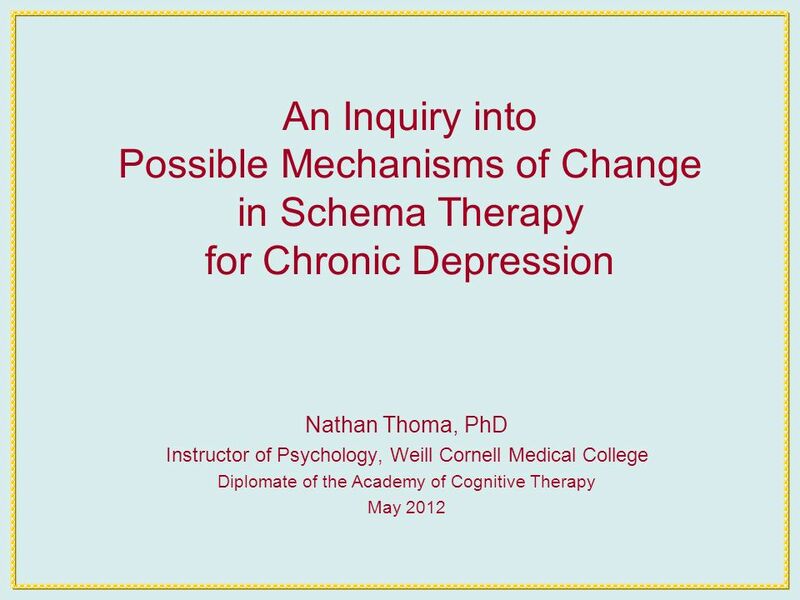 Download ppt "An Inquiry into Possible Mechanisms of Change in Schema Therapy for Chronic Depression Nathan Thoma, PhD Instructor of Psychology, Weill Cornell Medical." 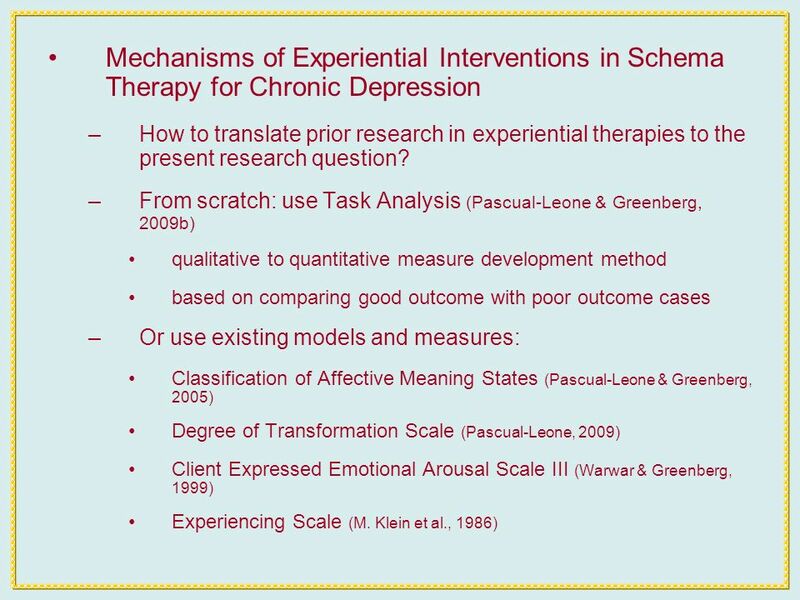 The Power of Behavioural Change and the Role of Cognitions in symptom severity and disability: Research Questions What treatments are effective for symptoms. 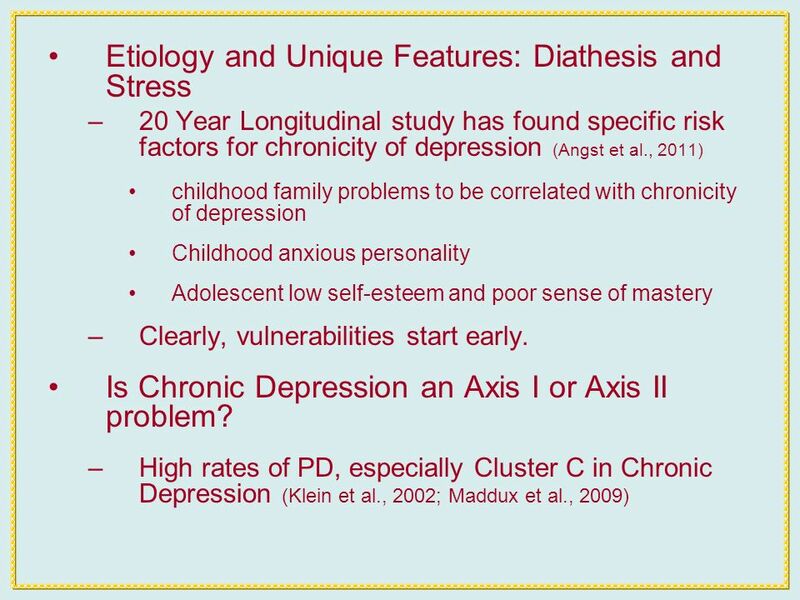 Clinical Child Psychology. 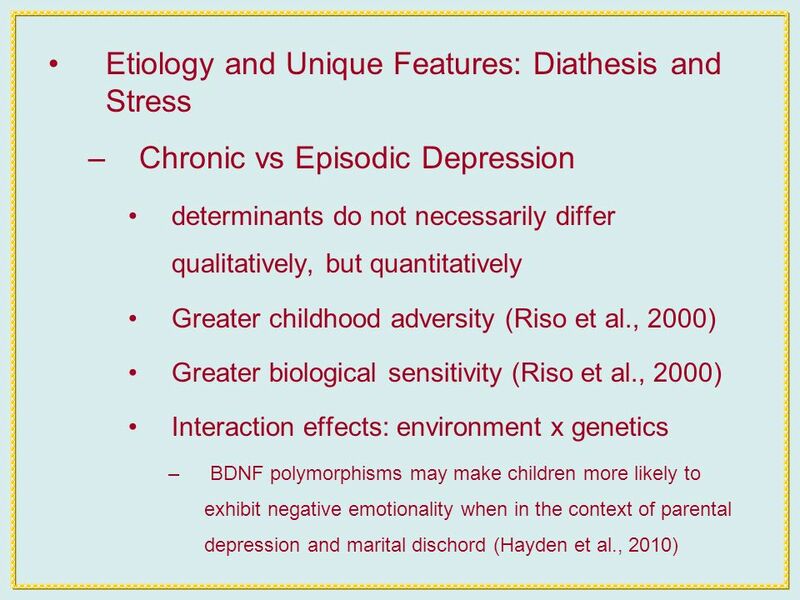 Clinical Child Psychology vs. Pediatric Psychology Considerable overlap, but… Clinical Child Psychologists – typically work. 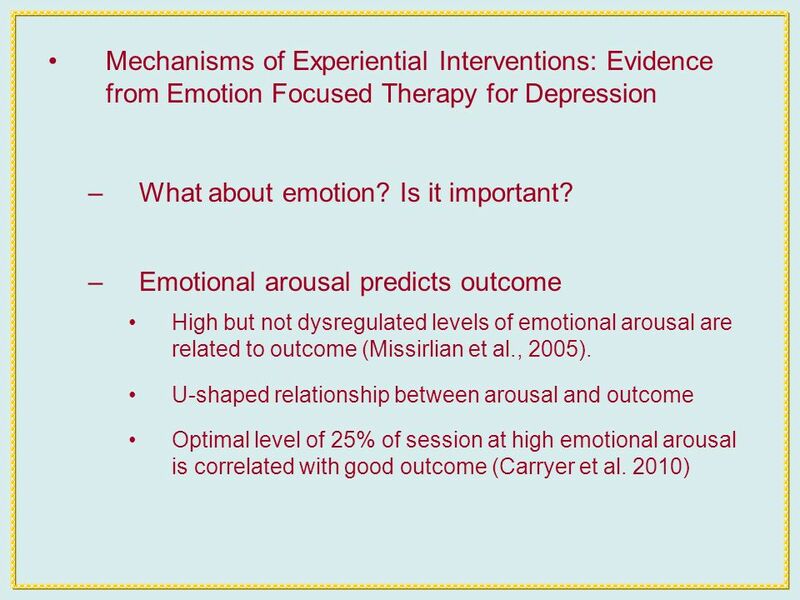 Developing a Compassion-Based Therapy for Trauma-Related Shame and Posttraumatic Stress Teresa M. Au, M.A. 1, 2 Brett T. Litz, Ph.D. 1, 2, 3 ACBS 2014. Children, Families and Poverty Ross A. Thompson, Ph.D. Department of Psychology. 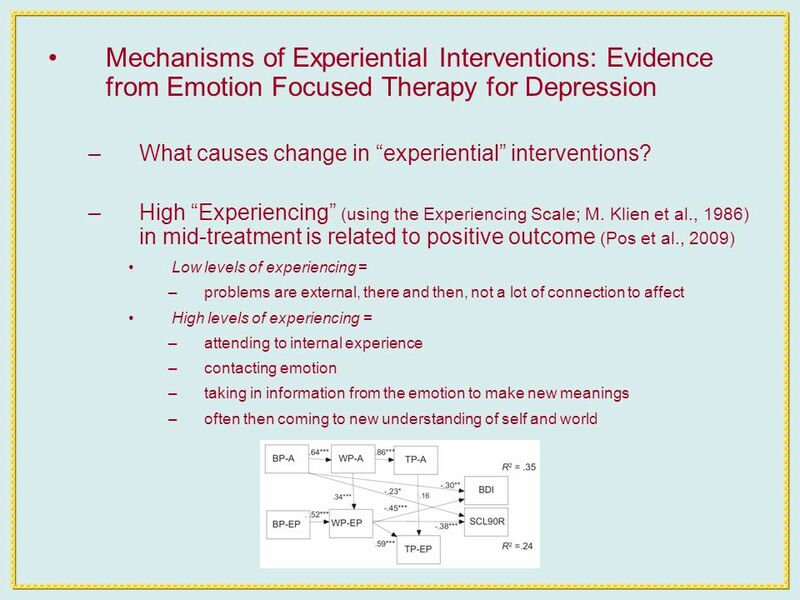 Person-Centred and Experiential Therapies for Depression and Anxiety Ladislav Timulak Trinity College Dublin.  Over the past 40 years, the prison population doubled. 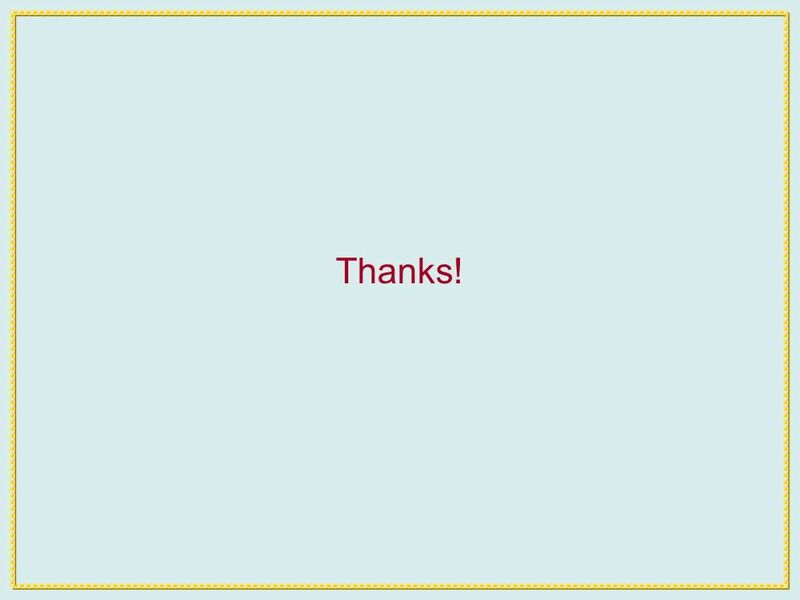  U.S. 5% of the world’s population and 25% of the world’s prisoners.  As mass incarceration. How Does Family Environment Affect Health Across the Lifespan? Shelley E. Taylor University of California, Los Angeles May 2008. 2010 Special Education Hearing Officers and Mediator Training (San Diego) The Nexus Between the DSM & IDEA: Social Maladjustment v. Emotional Disturbance. 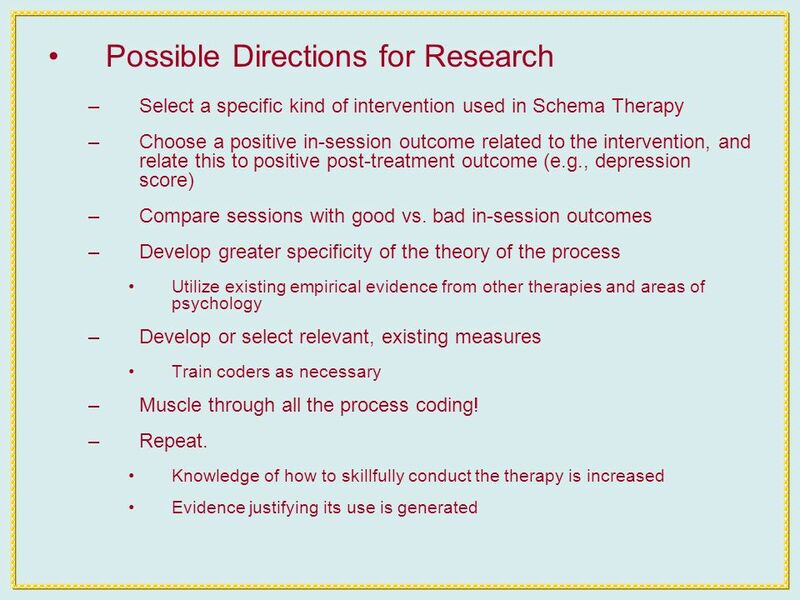 Learn to Evaluate Therapy Tapes in a Few Easy Steps Some Process Research Implements with a Taste of Outcome Research. 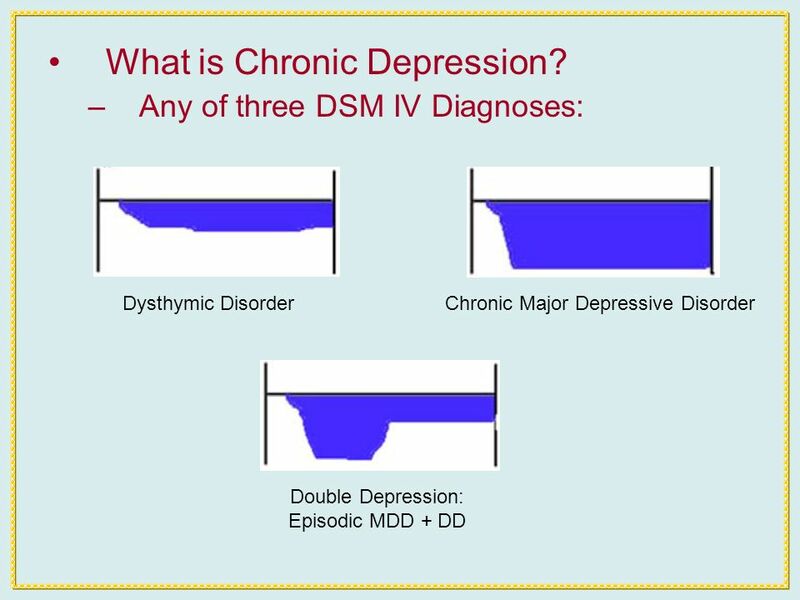 A Developmental Model of Childhood Traumatic Stress. 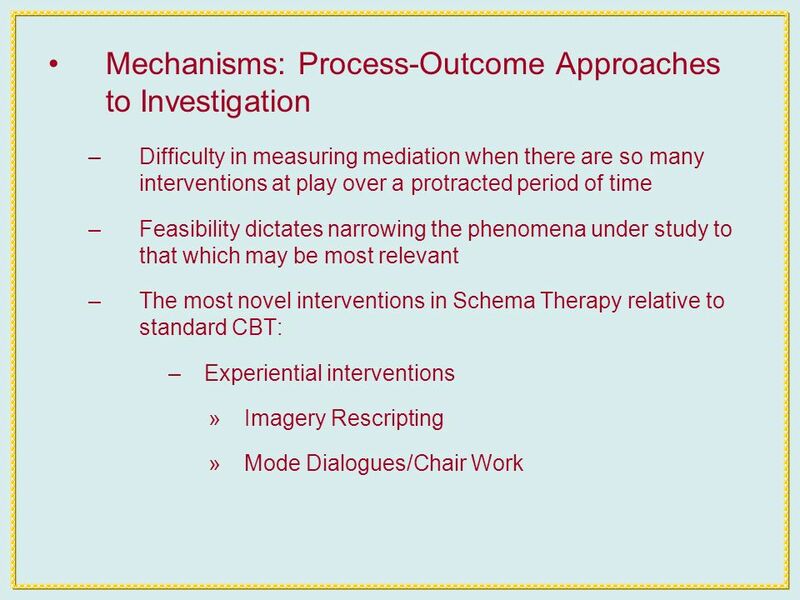 Developmental Tasks Associated with Toddlerhood. 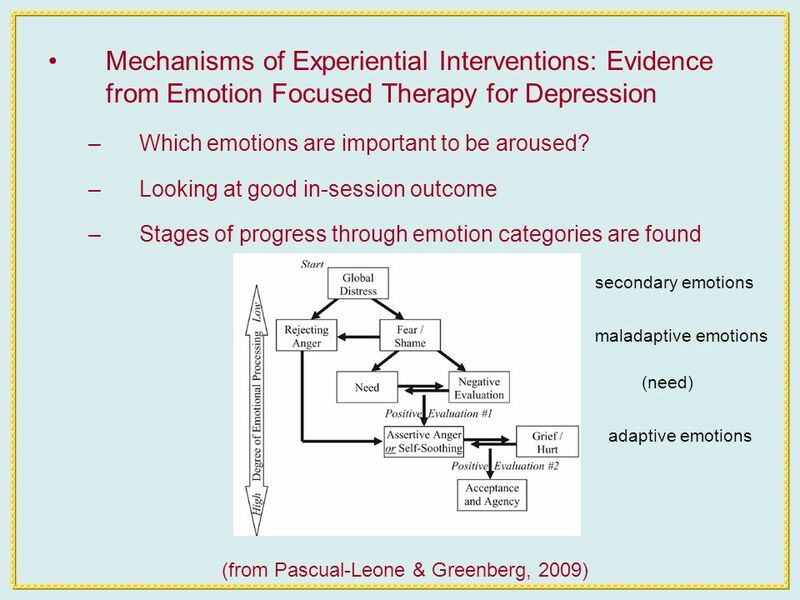 n Age range (18-36 months) n Differentiation of self and object representations n Integration of affectively. Psychological Aspects of Oncology Patient “Contributing Factors & Intervention” Elham Abd El-Kader Fayad Professor of Psychiatric & Mental Health Nursing.